Add some fun and style to your note-taking with this pack of 4 notebooks. These beautiful Silvine notebooks contain 160 full size A5+ pages, which are ruled with a margin for neat notes. The pages are made from 75gsm paper, which is perforated for easy removal. The wire binding allows the notebook to lie flat for easy note-taking and the notebooks also feature stylish hearts and flowers covers from the Marlene West range. 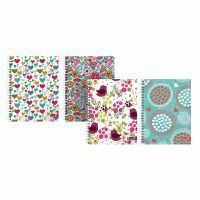 This pack contains 4 notebooks, each with a different design on the cover.